Lockleys Primary School is able to offer support to a number of students verified by the Department for Education as having specific learning difficulties. 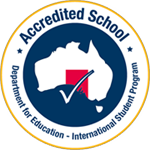 We have students who are identified on a number of criteria including Autism Spectrum (including Asperger’s), speech, global developmental delay, and intellectual disability. The range of support varies according to individual needs. Some students may be assessed as requiring a Negotiated Education Plan (NEP). We have access to a range of consultants at no cost to the parents including Speech Pathologists, Psychologists, Disability Coordinators, Interagency Student Behaviour Management Coordinators, Hearing Impairment Coordinators and Social Workers. We also support students with learning difficulties, who have not been verified by Department for Education personnel. This is done through classroom programs, possible SSO time, and small group literacy (MacqLit/MiniLit). The Learning Support is coordinated by the Principal and SWD (Student With a Disability) SSO coordinator. As a school who welcomes enrolments of multicultural students, we maintain small class sizes to give extra attention to students. All students who have English as an additional language at home will have their literacy and language levels assessed to determine the support that is required. Our EALD teacher works closely with those students and their families to ensure that the learning process is successful for all. In addition we have a bilingual student support person, who specialises in Hindi, work with some students for a period of time each week. We have a woman’s group whom meet each Wednesday and offers an excellent contact person to liaise with our school. Pastoral Support Workers (School Chaplains) have been working in schools since 1986. PSWs have a unique dimension of care and support to students, families and staff. In a government school, the Pastoral Support Program is primarily a service of pastoral care for students and their families, who want this support. Pastoral Support Workers are not in the school to evangelise on behalf of a particular faith group. The role is to respect both the secular character of the Government School and the variety of thoughts and beliefs within the school community.